Hawaii Gov. David Ige reportedly said he couldn't notify the public during the 38-minute false missile alarm because he forgot his Twitter password. The missile notification system was accidentally triggered last week after an employee mistakenly pushed the wrong button. Hawaii Gov. David Ige said the panic that ensued during a false alarm warning of an imminent missile attack wasn't addressed sooner because he forgot his Twitter password and couldn't notify the public. During a press conference on Monday, Ige took some of the blame the mix-up that caused panic throughout Hawaii and made headlines worldwide, according to the Honolulu Star Advertiser. The missile defense notification system was accidentally triggered on January 13 after an employee mistakenly pushed the wrong button and sent mobile notifications to all in the vicinity, warning them of an imminent ballistic missile attack. The blunder caused mass panic around Hawaii, as people quickly took cover and prepared for impact. A second alert clarifying that there was no missile threat to Hawaii was not sent out until 38 minutes after the initial notice. legit thought I was about to die in hawaii. at a goddamned doubletree. Soon after, officials confirmed that the alert was a mistake. 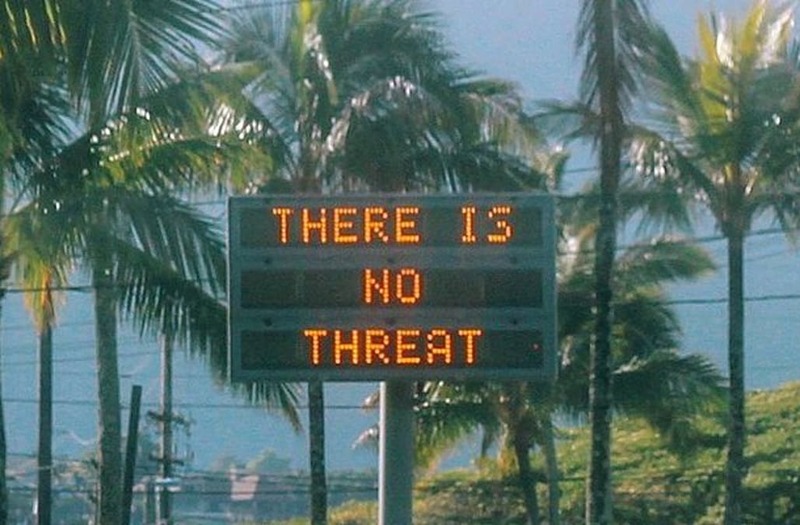 The Hawaii Emergency Management Agency tweeted, "NO missile threat to Hawaii." Ige responded to the incident at the time, saying the triggering of the alert system was an "error" and was being investigated to avoid the incident from "ever happening again." Hawaii began testing its nuclear warning system in December, CNN reported. It is the first time since the Cold War that Hawaii brought back the system and comes amid North Korea's increased missile testing.